Comments The mellow, endearing yellow of a pure and saatvik Yellow sapphire is matchless. The benevolent energies of this beautiful gemstone bring the best of Jupiter’s gifts – wisdom, good fortune and wealth, auspicious events, learning, personal growth and development and a fair sense of justice. 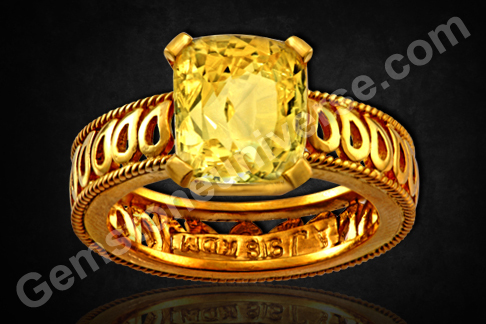 Featured today is a ceylonese yellow sapphire of 2.13 carats. 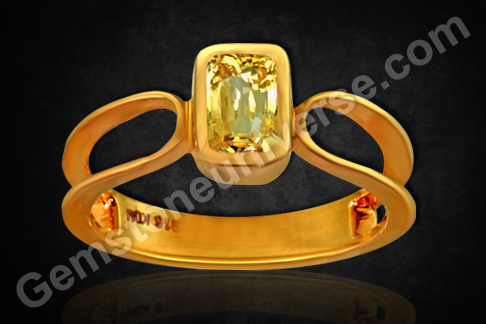 Finest golden yellow in color this yellow sapphire or pukhraj as it is popularly known has been set in a 22 Karat gold Ladies Yellow Sapphire Talisman ring. 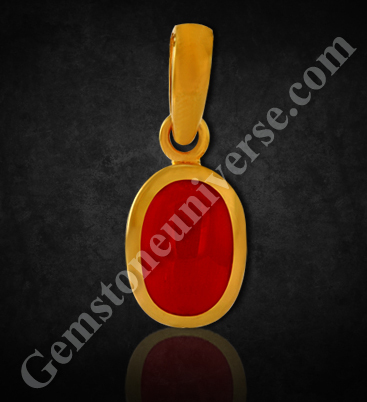 The electric lustre and the calrity of this completely natural and untreated gemstone render it the ideal jyotish gemstone. Vedic Astrology suggests the use of natural, untreated Yellow Sapphire for best results to be got from the Planet Jupiter/ Guru/ Brihaspati. Jupiter is the mentor of gods and stands for wisdom, truth, dharma and justice. It is especially good for female individuals as Jupiter is the significator of marriage and marital bliss in a female’s birthchart. However, it is strongly recommended that one should get the personal horoscope/ birthchart analysed for suitable gemstones before carrying forward with any kind of planetary gem therapy. The uniform deep royal blue color and amazing clarity make the gem an absolutely prized gem. 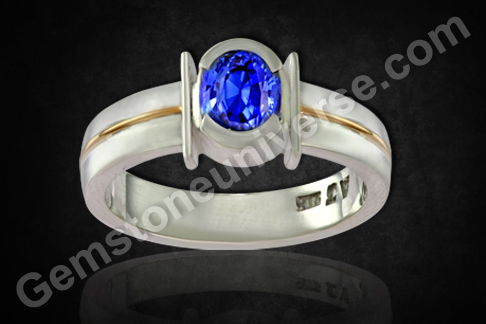 Pure and saatvik, the powers of Saturn or Shanidev can be harnessed through jyotish quality Blue sapphire. When mother nature decides to take the department of aesthetics and beauty under her wing, such special treasures emerge from her womb. The Ceylonese Blue sapphires are by far the best available in the markets today. 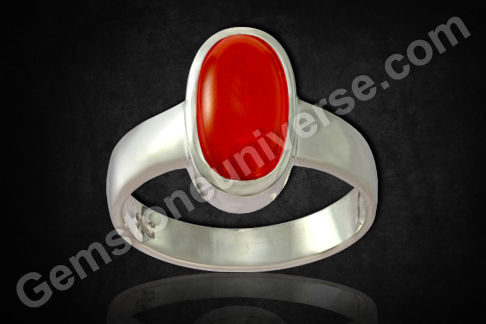 The neelam gemstone is one of the fastest in terms of delivering results. 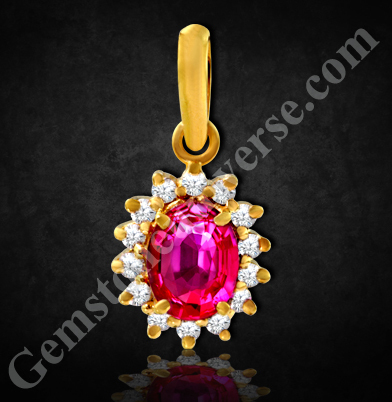 A good jyotish quality gem worn after proper recommendation and due consecration can bring a remarkable tangible and qualitative change in life. It is a treat for the eyes and a delight for the wearer. 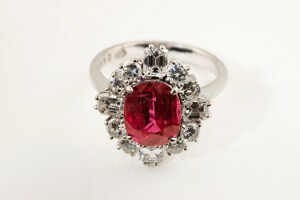 Such is the crimson allure that this piece of jewelry will not go unnoticed. 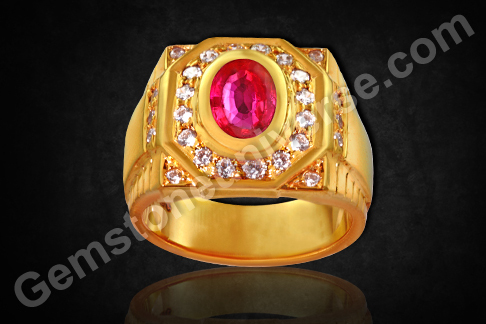 It is no longer news that natural, untreated rubies now command a premium price in the market and as the 4 C’s of gemstone are rendered better in quality, the price of the gem goes up exponentially. Meanwhile, enjoy this 3.89 carat Thai ruby set in 18 carat white gold which is accented by 4 emerald cut diamonds and 8 round brilliant cut diamonds, which is a part of the Smithsonian treasures! 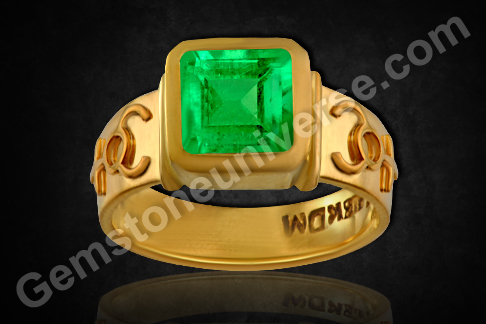 The classic step cut Emerald/ Panna is characterised by fine rich emerald green color and has great clarity. 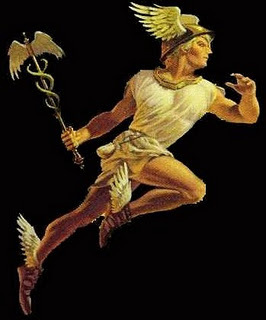 In the Ancient Greek Mythology, mercury is also known as Hermes, the messenger of the Gods. He is the patron deity of orators, traders, merchants, travellers and communicators. The character of Mercury is such that an individual governed by it is restless and needs something new and different to engage his/ her faculties in order to beat the boredom. Hermes, according to Greek mythology stole Apollo’s oxen in his infancy. The matter was somehow resolved by Zeus and Apollo finally ended up befriending him and giving him his own staff. Through that act, the powers of resolving disputes were vested in Mercury. Such was the power of the wand that once Hermes came across two serpents fighting viciously in the wild; as he struck the wand on the earth between the two serpents, they immediately quietened down and coiled up their bodies around the wand. This is what we now know as the symbol of Caduceus, which was the earliest symbol of peace and was later adapted as the symbol of medicine as well as healing. Comments The Sun is the king of the zodiac and naturally the most splendrous and the robust gem is symbolic of his majestic self. 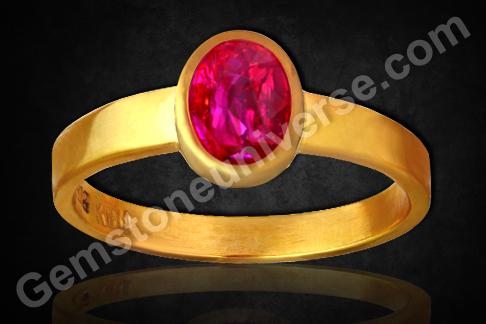 Fetaured today is a fully natural and untreated Ruby from Mozambique set in 22 karat gold as a Sun Talisman Ring. The vivid reddish pink color and sharp intensity make it a gem that packs in a tremendous punch! The Ruby is a phenomenal gem and a natural gem will actually mark its presence with a certain palpable energy/ heat upon touch. Also known as maanik or laal, it has been a favoured gem by all people in positions of power and authority. The Sun or Surya is the giver of light and has been revered across civilizations. This luminary is known as the pratyaksha devta or the only visible deity in the Hindu culture – one, whose energy and light not only nourishes and sustains life on the earth but also brightens up everything. A good run through the gem markets would be enough to give you a lowdown on how good burmese and Thai ruby is virtually unavailable. That leaves all hopeful eyes towards the African ruby producing belt which extends from Ethiopia to Tanzania. Mozambique ruby is typically one that exhibits greater clarity. Given the market conditions, a natural unheated ruby is actually an investment for the trade only projects the price per carat to escalate as time goes by. Yes, you can own the world now. And this is precisely the feeling one gets with this particular gem. However, for truly appreciating the above words, you must at hold such a saatvik, clean and weighty gem in your hands at least once! Additionally, what makes the yellow sapphire spectacular is its dimensions – a brilliantly crafted cushion cut gem (10.22*8.60*7.62). The Depth of the gem at 7.62 mm is phenomenal and allows it to sit with amazing splendor in its setting. The height of the crown and the depth of the pavillion give it a distinction, hard to match. Loupe Clean with rich canary Yellow Color, this beauty was fashioned into the scintillating Cushion cut in Idar Oberstein – Germany. Powerful Jupiter or Brihaspati energies abound in this Yellow Sapphire. 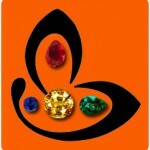 The sparkling gem has great potential for bringing good fortune, enable wise decision making and intensify knowledge. 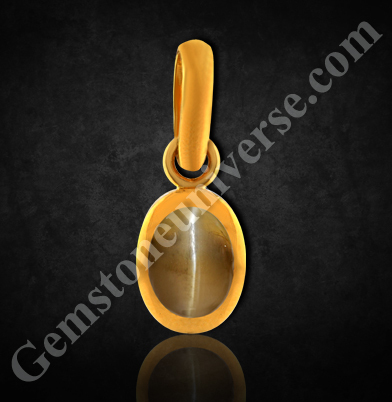 The healing properties of yellow sapphire are amazing and generally well known. 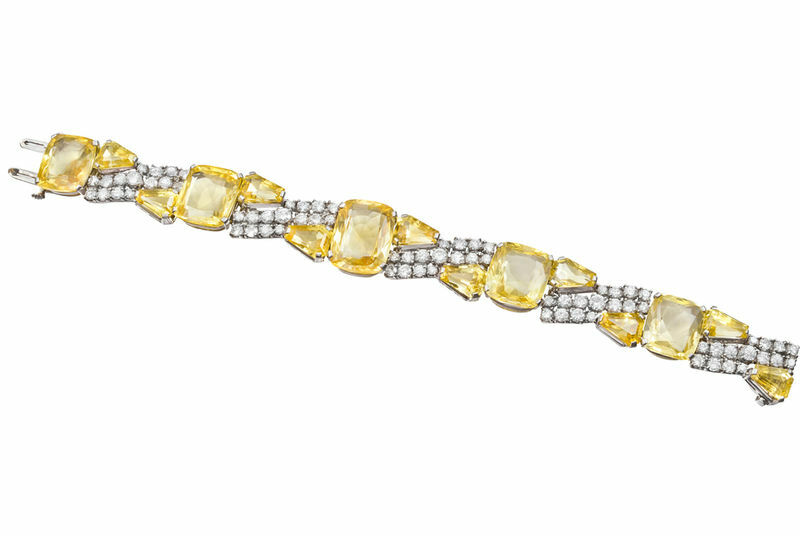 Meanwhile, also enjoy this Yellow sapphire, diamonds and platinum Bracelet exhibited by the Bruce Museum which is a part of a private gem collection. Yellow sapphires for your knowledge are a hot buy in the West for it looks like the much Prized Yellow Diamonds and also for the healing properties of the gem.